With 18 floors and over 180 cm (or 6 feet) tall, Wooootles has taken the modular standard to a new height with the stunning One Azure Hotel & Suites. Head over to Flickr for a closer look at this beautiful high-rise building. One of my favourite builders, Castor Troy, helps us take a step back in time with his contributions to the Paris Steampunk 1889 collaboration. Head over to the Flickr group for more awesome creations for the collaboration. As always, thanks Castor Troy for the inspiration! Palixa and the Bricks’ modified Cafe Corner building has come under new management and they have spared no expense in renovations, not only redoing the facade, but also adding a whole new floor to the hotel. Budgets were clearly not an issue with this renovation. Each room has its own ensuite and has been beautifully furnished with bright, modern furnishings. Even the attic has been converted into an opulent suite. Modifying the Cafe Corner like this not only looks great, but also allows you to experiment with colour combinations and essentially have one of the originals modular buildings without the expense. Best of all you don’t need a copy of the original model, as you can download the instructions (BrickSet). Head over to Flickr to see more of Palixa’s modified Cafe Corner. Your first thought may be, why a modular conversion, as this building is most of the way there already, right? Ditch the elevator and make the floors a bit wider and there you have it. That would be too simple. Reanard Pangestu, from the Modular LEGO Buildings group over on Facebook, has created his own version of the classic Cafe Corner. I love the simple colour scheme of this version, the use of the 1×1 round tiles in Pearl Gold on the awnings and the feature tiling in front of the door. This is a great way to learn about building techniques, while at the same time creating one of the classic modular buildings without breaking the bank. There are more images of Reanard’s customised Cafe Corner on Facebook and, if you want to have a go yourself, you can find the instructions for the Cafe Corner on BrickSet and the original parts list on Rebrickable. With its bright light yellow facade and open spaces, you can almost feel the warm sea breezes coming off the the gorgeous Modular Seaside Hotel created by Azurekingfisher. I love the way that the main entrance is framed by the frame and the double story arched windows. The rear of this building is just as gorgeous and could easily be mistaken for the front. There are no furnishings, but the interior layout (here and here) looks like it allows for a reception, dining room and three guest rooms. Head over to Azurkingfisher’s Flickr stream for more images of the Modular Seaside Hotel. The Imperial Hotel, built by O0ger for the “The City we Built” competition over on www.swebrick.se, is one one those those buildings that commands your attention, from the solid pillars on the ground floor to the beautifully framed windows. The details that immediately stood out for me are the lights for lighting up the façade at night time, the cap on the chimney, the planters and the cute post boxes. Taking a closer look, however, I see that that, while the well-heeled live it up in the Imperial Hotel, the beggar is left to trawl through the cleverly built rubbish bins for his next meal! See more images of the Imperial Hotel on flickr! My posts usually start with some words, but this one had to lead with that picture as it just blew me away. The detailing on Barrie Crossan’s 2 Dutch Buildings is so exquisite, you could be forgiven for thinking you were looking at a real building! See lots more angles of these gorgeous buildings here. The cool breezy balcony wrapped in stunning wrought iron makes Eliza’s New Orleans Hotel the place to stay in the French Quarter! The wrought iron work on this building is just beautiful! And while it’s hard to take your eyes away from the wrought iron work, it’s worth doing so for the other features. I particularly like the fans on the balcony and the upper trim on the roof. 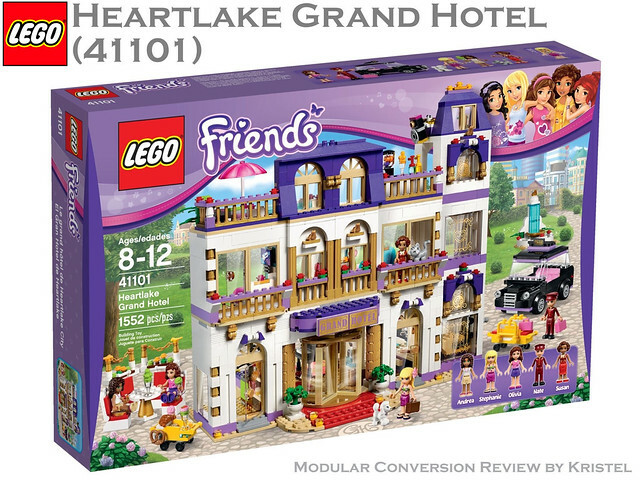 Head over to Eurobricks to see more of Eliza’s gorgeous building, including the fully furnished interior!